Written by journalism professor Sylvia Nasar, this book is an unauthorized biography of the award-winning mathematician John Forbes Nash, Jr. In 1994, he was one of three recipients who shared the Nobel Memorial Prize in Economic Sciences for their work with game theory. Published in 1998, this biography became a major success and entered the New York Times Bestseller List’ for biographies. 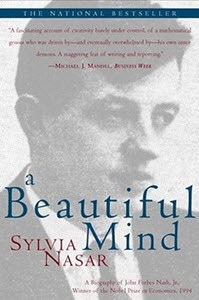 It won the National Book Critics Circle Award for a biography, and was also one of three final nominees for the Pulitzer Prize for Biography or Autobiography. 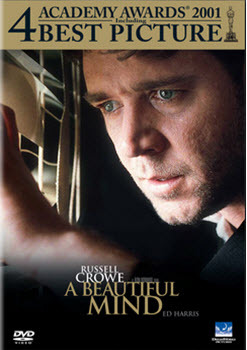 The 2001 movie A Beautiful Mind, directed by Ron Howard and starring Russell Crowe as John Nash, was inspired by the biography. 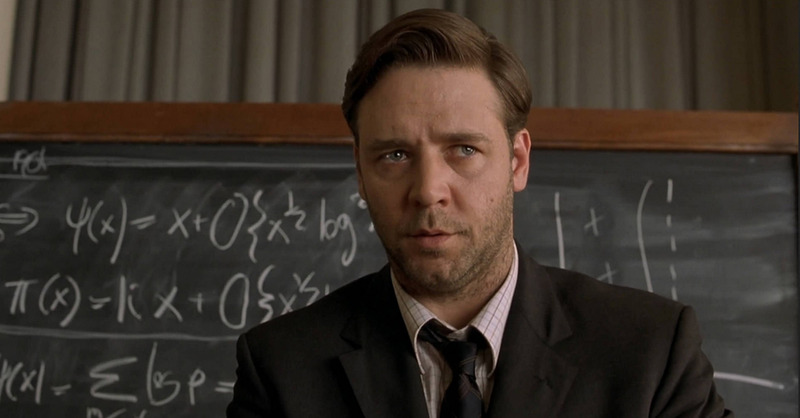 The 2001 film A Beautiful Mind was inspired by the biography of the same name, but differs from the book in several notable ways. The focus of the movie is on Nash’s mental health issues and how they affect those around him, especially his wife Alicia. The movie was directed by Ron Howard, with screenplay by Akiva Goldsman, and starring Russel Crowe and Jennifer Connelly in the roles of John and Alicia Nash. This film was generally well received and won several notable awards, including Academy Awards (“Oscars”) in the categories Best Picture, Best Director, Best Adapted Screenplay, and Best Supporting Actress. Made on a $58 million budget, the movie grossed over $313 million worldwide. Home media Released on VHS and DVD in the United States on 25 June, 2002. Released on Blu-ray in North America on 25 January, 2011. 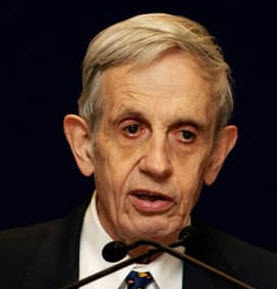 The mathematician John Forbes Nash Jr.
John Forbes Nash Jr (1928-2015) was United States mathematician, known for his contributions to game theory, differential geometry and the study of partial differential equations. Between 1945 and 1996, he published 23 scientific studies. His contributions to game theory have far reaching implications for a large number of industries. His theorems have made everything from currency trading to shipping and retail more efficient. The Nash equilibrium, the Nash embedding theorem, the Nash-Moser theorem, and the Nash functions, are all named after him. He also came up with a proof for Hilbert’s nineteenth problem, which by then had been eluding mathematicians for over half a decade. So far, Nash is the only person to recieve both the Nobel Prize and the Abel Prize. In 1994, he was one of three recipients of the Sveriges Riksbank Prize in Economic Sciences in Memory of Alfred Nobel, a price commonly referred to as the Nobel Prize in Economics. In 2015, Nash and Louis Nirenberg recieved the Abel Prize, a prestigious Norwegian prize modelled on the Nobel Prize, for outstanding achievements in mathematics. Nash was awarded the Nobel Prize for his contributions to game theory, while the Abel Prize was bestoved upon him for his work on nonlinear partial differential equations. Nash’s Alma Master was Princeton University, where he also worked briefly after earning his Ph. D there in 1950 with his dissertation on non-cooperative games. After Princeton he accepted a position at MIT, and also consulted for the RAND Corporation. In 1958, he earned tenure at MIT. In 1959, Nash was hospitalized and diagnosed with shizofrenia. During the 1960s, he spent several periods in physiatric in-patient care as he tried to battle he paranoid dillusions brought on by the disease. In 1970, his ex-wife Alicia allowed him to move in with her as a border, and after this he was not hospitalized again. Nash gradually learned to manage his condition, and could eventually begin to do some work in mathematics again and audit courses at Princeton. At Princeton, he became known as “The Phantom of the Hall” – a reclusive figure who could sometimes be seen in the middle of the night at the mathematics center, scribbling equations on the blackboards. Eventually, Nash got well enough to teach again. He and Alicia, who had remained his close friend and keen supporter throughout his struggle, rekindled their romantic relationship in the 1990s and remarried in 2001. On 23 May, 2015, John and Alicia Nash were killed in New Jersey as the taxi they were travelling in crashed. 3 The mathematician John Forbes Nash Jr.